These are New York Times articles that contained interesting facts about Mark Twain's life in Redding, with articles related to his family, homes and the Mark Twain Library after his death in 1910. I learned a lot putting this page together and hope you all enjoy it as much as I did. Captured After a Pistol Fight on a Train in Which Prisoner and Officer Are Shot. DANBURY, Conn., Sept. 18. - Mark Twain's home at Redding, "Innocents at Home," was visited by two professional burglars last night. The wakefulness of Miss Lyons, the humorist's private secretary, was the undoing of the bold crooks, who were captured after a fight on a New Haven train. There is nothing but plated ware in this house, now and henceforth. You will find it in that brass thing in the dining room, over the corner by the basket of kittens. If you want the basket put the kittens in the brass thing. Do not make a noise - it disturbs the family. You will find rubbers in the front hall by that thing which has the umbrellas in it - chiffonier I think they call it, or pergola, or something like that. Please close the door. Yours truly, S. L. CLEMENS. Miss Lyon the humorist's secretary, was aroused about midnight by the sound of breaking glass in the lower part of the house. She went softly down the stairs to find a flood of light in the dining room and that the sideboard, with its solid silver, was missing from its customary place in the room. Cautiously slipping along in the shadows to a point where she could have a view of the garden, to which her attention had been called by an open window in the dining room, Miss Lyon saw two men forcing the doors and drawers of the sideboard, which they had carried out, apparently in the hope that they would not be interrupted in their work. Without giving the burglars any cause for alarm Miss Lyon summoned Mr. Clemens and the butler and then telephoned for Deputy Sheriff Banks, Harry Lounsbury, and several neighbors. Before any of them reached the scene the burglars had fled with their booty. Following the awakening of Miss Lyon and her discovery that burglars had been at work, search of Mark Twain's place was made by Mr. Lounsbury, the Deputy Sheriff, and neighbors, and on the lawn some distance away was found the empty drawer. Mr. Lounsbury and Deputy Sheriff Banks found peculiar footprints, which they followed to Bethel. Mr. Lounsbury discovered the men on the train in the smoking car. He attempted to engage them in conversation and asked them if they lived in Danbury. The men replied vaguely. Mr. Lounsbury said he noticed that both men's shoes had rubber heels, which it was said would correspond with the tracks in the roadway. When the train arrived at Redding Mr. Lounsbury got off and notified Banks that he believed the men they were after were the two to whom he had been talking. Banks boarded the train, and when an attempt was made to arrest the burglars one ran out of the car door and jumped off and the other showed fight and drew a revolver. He fired four shots, one of which struck the Sheriff in the leg, and one, the last in the struggle, hit the burglar himself in the head. A passenger jumped into the fight and subdued the burglar with a club, cutting his head open. The burglar who jumped was found under a bridge in Brookside Park. A physician was called and the wounds of the Sheriff and of the injured robber were attended to. Later in the morning the men were taken before Justice Hickerson for a hearing. Mr. Clemens, his daughter, Miss Clara, and Mr. Wark appeared at the hearing. The men had taken only the solid silverware and this was all recovered. The plated ware they had evidently discarded. The hearing was held in a small room of an old-fashioned house. Justice Nickerson sitting at a little table. The witnesses and the prisoners occupied the same settee. Mr. Clemens had on his white suit. The prisoners described themselves as Charles Hoffman, aged 30, of South Norwalk, and Henry Williams, aged 40, no address. Both men were held for the Superior Court. Other counts of assault, resisting an officer, and carrying concealed weapons were lodged against Williams. He was the wounded man. They were taken to the Bridgeport Jail this afternoon. Later they were taken before Judge William Case of the Superior Court. Williams was charged with burglary, and held under $5,000 bail. Besides the burglary charge, a second charge of assault, with intent to kill, was entered against Hoffman, and his bail fixed at $7,500. Men Who Broke Into Samuel L. Clemens's Home Get Prison Terms. DANBURY, Conn., Nov. 11 - When the trial of Henry Williams and Charles Hoffman, accused of breaking into the Italian villa of Samuel L. Clemens, (Mark Twain,) at Redding, several weeks ago, was resumed in the Superior Court this afternoon, both men changed their pleas of not guilty to guilty. The court sentenced Hoffman to not less than three nor more than five years in State prison. On the charge of burglary Williams received not less than five nor more than six years in State prison, and on the charge of assault with intent to kill, to which he also pleaded guilty, not more than four years in State prison. Passes His Birthday Quietly at His Connecticut Home. REDDING, Conn., Nov. 30. - Samuel Clemens (Mark Twain) passed his seventy-third birthday quietly at his home here today. As was his custom, Mr. Clemens took his morning ride, passing the remainder of the day with his household. O. Gabrilowitsch Stops Runaway Horse About to Plunge Down a Bank. DANBURY, Conn., Dec. 20. - Miss Clara Clemens, daughter of Samuel L. Clemens, (Mark Twain) was saved from serious injury and possible death this morning through the action of Ossip Gabrilowitsch, a Russian pianist, who is a guest at Innocent at Home, the residence of Mark Twain. M. Gabrilowitsch, who is making a tour of America, and Miss Clemens went for a sleigh ride this morning, leaving the Twain residence at 10 o'clock. While passing through Redding Glen, about three miles from Miss Clemens's home, the horse took fright at a wind whipped newspaper and bolted. Mr. Gabrilowitsch, who was driving, lost control of the horse. At the top of a hill the sleigh overturned, and Miss Clemens was thrown out. At the right of the summit of the hill is a drop of fifty feet. When the sleigh turned over the Russian leaped to the ground, and caught the horse by the head, stopping it as it was about to plunge over the bank, dragging Miss Clemens, whose dress had caught in the runner. In leaping to rescue Miss Clemens he sprained his right ankle. Miss Clemens was picked up uninjured, but suffered greatly from the shock of the accident. The injury to the pianist's ankle was painful, but he helped Miss Clemens into the sleigh, and drove her to her home. Mark Twain Adds 150 Acres to Farm. REDDING, Conn., April 8. - Samuel L. Clemens, (Mark Twain,) has purchased 150 acres of land adjoining his recently acquired property. The "farm," as the author calls his beautiful estate, now comprises 350 acres of agricultural and wooded tracts, near the centre of which is the Clemens home. The house, an inviting abode, rises from a knoll that commands a far view of the surrounding country. Apoplexy Carries Off the Financier Famous in Standard Oil, Railways, Gas, and Copper. He Heard the News on Arriving in Town to Visit His Old Friend. Samuel L. Clemens, (Mark Twain,) for years one of the warmest friends of Mr. Rogers, arrived in town from his home in Redding, Conn., at noon yesterday intending to meet Mr. Rogers at the latter's home, and heard the news of his death on arrival at the Grand Central Station. A telegram apprising Mr. Clemens of the death of his old friend had been sent to Redding yesterday morning, but Mr. Clemens did not receive it, and did not know that Mr. Rogers was dead until after he arrived. As Mr. Clemens left the station he looked greatly grieved, and was leaning heavily upon the arm of his daughter, Miss Clemens, who had accompanied him to New York from Redding. Tears filled his eyes and his hands were trembling. Several reporters who had met the Pittsfield express, on which Mr. Clemens came to New York, were at the train to meet him. "This is terrible, terrible, and I cannot talk about it," Mr. Clemens said to the reporters. "I am inexpressibly shocked and grieved. I do not know just where I will go." Miss Clemens explained that her father had left his home not knowing anything about the death of his friend, and had expected to enjoy the day with him. The members of the Rogers household, knowing that he was coming, had notified her as soon as the death had occurred, that she might break the news to him as gently as possible. The first intimation, she said, that her father received that Mr. Rogers was not living and in good health was from herself. Mr. Clemens and his daughter lingered in the waiting room on the main station for a few minutes. Then Mark Twain, still leaning on his daughter's arm and looking toward the ground, walked slowly to the street through the Forty-second Street exit. Together they proceeded to the Subway station and boarded an uptown express. Later in the day Mr. Clemens went to the home of Urban H. Broughton, son-in-law of Mr. Rogers, where they were joined by other friends of the family. After spending a few minutes there he reappeared and went away in a carriage. He did not go to the Rogers home and it was said that he had probably returned to Redding. Mrs. Ashcroft Hurries Back from Her Honeymoon Abroad to Find Out About $4,000 Suit. She Thinks the Attachment on the Humorist's Gift House is the Work of His Daughter. Mrs. Ralph Ashcroft, who until her marriage a few weeks ago, was Miss I. N. [sic] Lyon, secretary to Mark Twain, arrived yesterday on the Cunard liner Carmania to learn why Mr. Clemens had obtained an attachment of $4,000 against the house in Redding, Conn., he gave her when she got married. She is a demure-looking woman, but was wroth when she landed, for she had to leave her husband and cut short their honeymoon to return to America. She lays the blame for it all on Miss Clemens, daughter of the humorist, whose artistic temperament, she said, often led her in the wrong direction. Mrs. Ashcroft was met at the pier by her mother, and after a day in New York she will beard [sic] Mark Twain in his country home, Stormfield, to learn the true inwardness of the attachment and seek an adjustment of the matter. "Two weeks ago in London I was notified that Mr. Clemens had sworn out an attachment against he house he gave me," said Mrs. Ashcroft. "I came home as soon as I possibly could, leaving my husband behind. I cannot think that Mr. Clemens is responsible for what has happened. He and I were the best of friends, and he has treated me almost as would a father. "For seven years I was closely associated with him. I relieved him of every care I could, and he gave me the house, and later lent me the money with which to furnish it. This money, both understood, was to be paid back when I could do so. Knowing him as I do, I cannot believe that he attached the property. "I believe the whole trouble is caused by his daughter. Miss Clemens is of the artistic temperament, but in this affair I believe that she has been wrongly advised into taking a step she would never have taken had she the right understanding of the case." Mrs. Ashcroft said she intended to take steps at once to adjust the matter. She thinks that the whole trouble must be due to some mistake. She said that no request had been made by her former employer for a return of the money. Indeed, she said, that several times she had refused suggestions from him that she consider the cost of fixing up and furnishing the house as a gift from him. "If Miss Clemens knows all about the case, and I notice that she says she is fully informed as to her father's affairs, she must know that every step in the restoration of the house was done not only with her father's knowledge but with his approval," continued Mrs. Ashcroft. "She does not exhibit a surprising knowledge of affairs when she presented her case, for in spite of what is said to the contrary, every cent that was expended for renovation I incurred a liability to pay. "Mr. Clemens has notes amounting to nearly $1,000, which were signed by my husband when the first rough estimate was made of the cost of fitting up the place. Mr. Clemens made a written agreement with Mr. Ashcroft to accept his notes for the balance of the indebtedness outstanding upon the completion of repairs. "The whole case will be settled, but the shame of it is that I should have been placed in an improper and false light." Mr. Ashcroft was formerly financial secretary to Mr. Clemens. It is said that both left the humorist's service because of differences with Miss Clemens. Former Secretary, Whom Mark Twain is Suing, Did Not Call on Novelist. Special to The New York Times. REDDING, Conn., July 15. - Mrs. Ralph W. Ashcroft, a former secretary of Mark Twain, who is being sued by the author for $4,000, and who has just got back from England, where she was on her honeymoon, did not see Mark Twain today, nor has she yet come back to her home here. Miss Clemens and Mr. Clemens's secretary saw a TIMES reporter at Stormfield, the novelist's home, and said that Mr. Clemens would have nothing further to say about the matter, which was in the hands of his lawyer. CLEMENS SUIT A SURPRISE. R. W.
Ashcroft Says His Wife Was Prostrated by News of Author's Action. Among the passengers on the Caronia from Liverpool yesterday was R. W. Ashcroft, whose wife was formerly private secretary to Mark Twain, and was recently sued by the author for a return of the house he presented her with on her wedding day. Mr. Ashcroft said that they went abroad on June 9 and spent some days at The Hague. On their arrival in London he was surprised to receive a letter containing clippings and a notice of the suit begun by Mr. Clemens and the attachment on the dwelling presented to Mrs. Ashcroft. "It came like a bolt out of the blue," said Mr. Ashcroft, "and I was glad to hear that the matter had been settled, as my wife was completely prostrated by the news, and wanted to sail home at once to face the music. I persuaded her to take things calmly and come by the Carmania, which she did. Mr. Ashcroft admitted that there might be some truth in the report that a wealthy friend of his father's had some influence with Mr. Clemens in settling the matter, but he declined to give his name. Says Mark Twain's Daughter Made Charges Because She Was Jealous of Her Success. In It He Praised His Secretary and Rebuked Daughter for Complaints - No Diversion of Funds. Ralph W. Ashcroft, manager of the Mark Twain Company at 24 Stone Street, whose wife, for years before her marriage was private secretary to Mr. Clemens, was sued by the humorist to recover $4,000, gave out a statement yesterday in which he warmly defends his wife against insinuations that she misused Mr. Clemens's money. Mr. Ashcroft, in his statement, accuses Miss Clara Clemens, daughter of the humorist, of having been envious of Miss Lyon's achievements as secretary to her father. Miss Clemens, he says, wanted to have Miss Lyon removed from her place. Mr. Ashcroft declares that it was without the knowledge of the humorist's New York lawyers that the cottage at Redding, Conn., adjoining the Clemens estate, which he gave to Miss Lyon, was attached in his recent suit. He gives excerpts from the author's letters to indicate the high opinion he once had of Miss Lyon. "Since my return from Europe, a week ago, I have thoroughly investigated the occurrences connected with quarrels forced on Mrs. Ashcroft by Mark Twain's daughters, and have heard what both sides have to say in the matter. "To understand the matter in its true light, it is necessary to hark back to the Summer of 1904, when Mrs. Clemens died in Italy. Mrs. Ashcroft (then Miss Lyon) was Mark Twain's secretary. When his wife died, Mark Twain was like a ship without a rudder, and, as Henry H. Rogers said to me a few days before he died: 'At that crisis in his life, Clemens needed just such a person as Miss Lyon to look after him and his affairs, and Miss Lyon came to the front and has stayed at the front all these years and no one has any right to criticize her.' "
Daughters Jealous of Miss Lyon. "For two years or more after their mother's death, both girls were in sanitaria most of the time, and the younger daughter has been under the care of nerve specialists ever since. Under these circumstances, Miss Lyon naturally became Mr. Clemens's hostess and person of affairs and how well she fulfilled the position is known to all who met her in those capacities. Both daughters, however, became jealous of her, were afraid that Mark Twain would marry her, and often endeavored to destroy his confidence in her. She probably would have been supplanted two or three years ago, but the elder daughter had musical and other ambitions, and thought more of them than of taking care of her old father and filling her mother's place. "One's vocal ambitions, however, sometimes exceed one's capabilities in that direction, and the bitter realization of this has, in this instance, caused the baiting of a woman who has earned and kept the admiration and respect of all of Mark Twain's friends. Mark Twain well has said of her: 'I know her better than I have known any one on this planet, except Mrs. Clemens.' When one of his daughters made an attack on her about two years ago, he wrote this: I have to have somebody in whom I have confidence to attend to every detail of my daily affairs for me except my literary work. I attend to not one of them myself; I give the instructions and see that they are obeyed. I give Miss Lyon instructions - she does nothing of her own initiative. When you blame her, you are merely blaming me - she is not open to criticism in the matter. When I find that you are not happy in that place, I instruct her to ask Dr. Peterson and Hunt to provide change for you, and she obeys the instructions. In her own case I provide no change, for she does all my matters well, and although they are often delicate and difficult, she makes no enemies, either for herself or me. I am not acquainted with another human being of who this could be said. It would not be possible for any other person to see reporters and strangers every day, refuse their requests, and yet send them away good and permanent friends to me and herself - but I should make enemies of many of them if I tried to talk with them. The servants in the house are her friend, they all have confidence in her, and not many people can win and keep a servant's friendship and esteem - one of your mother's highest talents. All Tuxedo likes Miss Lyon - the hackmen, the aristocrats and all. She has failed to secure your confidence and esteem, and I am sorry. I wish it were otherwise, but it is no argument since she has not failed in any other person's case. One failure to fifteen hundred successes means that the fault is not with her. The Expense Accounts Explained. "The only person, so far as I know, who has charged Mrs. Ashcroft with dishonesty is Clara Clemens. Mark Twain has not and his lawyers have not. As is the custom in all large households, so it was in the Clemens household - money was drawn from the bank in cash to pay the thousand-and-one debts and expenses that it is not convenient to pay by check. When Mark Twain placed all of his financial responsibilities on Miss Lyon's shoulders (in addition to her other manifold duties) he did not tell her to employ a bookkeeper to keep a set of books, and she simply followed the custom that had been in vogue under Mr. Clemens's regime, to wit: no books of account were kept (other than the check book) and no itemized or other record was kept of cash expenditures. Miss Lyon was never asked to keep any such record, and did not do so. "Clara Clemens now insinuates that Miss Lyon embezzled a large part of the money she drew from the bank in cash. Fortunately Miss Lyon is in a position to prove that the bulk of the money was paid to Clara Clemens herself for the expenses of concert tours and the delightful experience of paying for the hire of concert halls destined to be mainly filled with 'snow' or 'paper,' for the maintenance of her accompanist, Charles E. Wark, and to defray other cash expenditures that an embryonic Tetrezzini is naturally called upon to make. Returning home one day from an unsuccessful and disheartening tour Clara Clemens simply couldn't stomach the sight of Miss Lyon's successful administration of her father's affairs. So it became a case of 'get rid of her by hook or crook' and she endeavored to enlist my sympathies and services along these lines, with the result that - well, I married Miss Lyon. "Mr. Clemens's New York lawyers now state that Mrs. Ashcroft's cottage was attached without their knowledge or advice. They also now state that they did not know that Mr. Clemens and I had made an agreement regarding the money he advanced for the rehabilitation for the cottage, which agreement makes his suit against Mrs. Ashcroft for this indebtedness absolutely groundless and farcical, in that no one can sue for a debt which has been partially paid and the balance of which is not due. Redding, Conn., March 13, 1909. Received from R. W. Ashcroft is notes for the sum of $982.47, being estimated balance due on money advance to Isabel V. Lyon for the renovation of "The Lobster Pot," this receipt being given on the understanding that said Ashcroft will pay in like manner any further amounts that his examination of my disbursements for the fiscal year ending Feb. 23, 1909, shows were advanced for like purposes. I agree to the above and to make said examination as promptly as my other duties will permit. An Amicable Settlement. "The matter has been settled amicably as far as Mark Twain, Mrs. Ashcroft, and I are concerned, and the adjustment will be consummated as soon as the proper papers can be drawn up, although it may be necessary for Mrs. Ashcroft to commence suit against Mark Twain to set aside the deed transferring the cottage to him, simply to protect her legal rights for the time being; as, while we believe that Mark Twain and his lawyer, John B. Stanchfield, will abide by their promises, still there is always the contingency of the death of either or both to be provided against. If Mr. Rogers had not died so suddenly and unexpectedly the affair would have been settled long ago without any publicity. It is an unfortunate occurrence all around. I am still manager of the Mark Twain Company, and shall so remain for the present. My contract has nearly two years to run." Efforts to talk with Mr. Clemens at his home in Redding last night were futile. A TIMES reporter called up the humorist's home on the telephone, was informed that he had retired, and that, under no circumstances, would any word of Mr. Ashcroft's statement by conveyed to him. It was stated that Miss Clemens was at home, but that she, too, had retired, and that no communication would be taken to her until morning. It was also found impossible to reach John B. Stanchfield, Mr. Clemens's lawyer. MARK TWAIN SUITS ALL OFF. The differences between Mark Twain and his daughter, Miss Clara Clemens, on the one side, and his former secretary Mrs. Ralph Ashcroft, and her husband have been settled without an appeal to the courts. All criticism of the conduct of Mrs. Ashcroft has been withdrawn and all suits have been dropped. On their part the Ashcrofts ratify and confirm the conveyance to Mark Twain by Mrs. Ashcroft of the house, known as the Lobster Pot, which adjoins Mr. Clemens's estate at Redding, Conn., the gift of which to his former secretary on her marriage is understood to have been the beginning of the trouble. During the controversy it was contended by Mr. and Mrs. Ashcroft that the deed transferring the house back to the humorist had been signed by Mrs. Ashcroft under duress. In addition Mr. and Mrs. Ashcroft have agreed to withdraw the suits which they brought against Mark Twain and Miss Clemens for defamation of character. On the other hand Mark Twain has agreed to drop his suit against Mrs. Ashcroft for an alleged loan of $3,050 and has removed the attachment which he had caused to be placed on the property of his former secretary at Farmington. Reparation has also been made for the hard things which the Ashcrofts alleged had been said of them by the author and Miss Clemens. Mark Twain has signed a document acquitting Mrs. Ashcroft of all blame for her conduct of his affairs while she was in his employ as his secretary. Miss Clara Clemens has also to the satisfaction of Mr. and Mrs. Ashcroft retracted the criticisms she is alleged to have made on Mrs. Ashcroft. Meanwhile, Mr. Ashcroft continues to be Secretary and Treasurer of the Mark Twain Company, which manages the business connected with the publication and sale of the humorist's works. It is understood that on the exoneration of his wife he offered to resign his place, but Mark Twain requested him to continue to hold it. Mark Twain's Daughter to Become the Bride of Ossip Gabrilowitsch. Miss Clara L. Clemens, daughter of Mark Twain, will become today the bride of Ossip Gabrilowitsch, the Russian pianist. The ceremony will take place at noon at the bride's home in Redding, Conn. About forty intimate friends of Miss Clemens and Mr. Gabrilowitsch have been invited to the wedding, and a special car for their use will be attached to one of the morning trains from New York. The Rev. Dr. Joseph Twitchell of Hartford, Conn., a life-long friend of Mark Twain, will perform the ceremony. Mark Twain, in Scarlet Cap and Gown, Sees His Daughter Married to Russian Pianist. Humorist in Prepared Interview Says a Happy Marriage is One of the Tragically Solemn Things of Life. WEST REDDING, Conn., Oct. 6. - Miss Clara L. Clemens, daughter of Samuel L. Clemens, (Mark Twain,) was married at noon today to Ossip Gabrilowitsch, the Russian pianist. The wedding took place in the drawing room at Stormfield, Mr. Clemens's country home, with the Rev. Dr. Joseph H. Twitchell of Hartford, a close friend of Mr. Clemens, as officiating clergyman. The bride was attended only by her sister, Miss Jean Clemens, but her cousins, Jervis Langdon of Elmira, N. Y., and Mrs. Julia Loomis, wife of Edward Loomis, Vice President of the Delaware Lackawanna & Western Railroad, were present. Miss Ethel Newcomb of New York City played a wedding march as the bridal party entered the drawing room. This room was prettily decorated with evergreens. Autumn leaves, and roses, and the bride and bridegroom stood beneath a bower of white roses and smilax. While the ceremony was being performed Mr. Clemens was attired in he scarlet cap and gown which he wore when the Degree of Doctor of Literature was conferred upon him by Oxford University. After the wedding he wore a white flannel suit. Forty guests from New York City were present and attended a wedding breakfast which followed the marriage. Mr. and Mrs. Gabrilowitsch left for New York this afternoon. After remaining that city about a week they will go to Berlin, where Mr. Gabrilowitsch has taken a house. Later Mr. Gabrilowitsch will make a tour of Germany in concerts. Mark Twain's Interview. Mr. Clemens prepared the following characteristic interview "to avoid any delays at the ceremony," as he expressed it. Speaking of the bride and bridegroom Mr. Clemens said: "Clara and Gabrilowitsch were pupils together under Leschetizky, in Vienna, ten years ago. We have known him intimately ever since. It's not new - the engagement. It was made and dissolved twice six years ago. Recovering from a perilous surgical operation, two or three months passed by him here in the house ended a week or ten days ago in renewal. The wedding had to be sudden for Gabrilowitsch's European season is ready to begin. The pair will said a fortnight from now. The first engagements are in Germany. They have taken a house in Berlin." "Can you say a word or two about the Redding Mark Twain Library?" "The village did me the honor to name it so. It flourishes. The people came to it from a mile or so around. We are all engaged in propagating the building fund, in a social and inexpensive way, through picnics, afternoon teas, and other frolics in the neighborhood, with now and then a full strength concert in my house at ostentatious prices. We had one last week with a team composed of Gabrilowitsch, David Bispham, and his bride, with me as introducer and police. "We had an audience of 525. When I have a male guest I charge him a dollar for his bed and turn the money into the fund and give him an autographed receipt, which he carries away and sells for $1.10." Doesn't Work, But Takes Exercise. "Are you at work now?" "No, I don't work. I have a troublesome pain in my breast which won't allow it, and won't allow me to stir out of the house. But I play billiards for exercise. Albert Bigelow Paine, my biographer and business manager, plays with me. He comes over every day for two or three hours. He has a farm half a mile from here upon which he raises hopes." "Do you like it here at Stormfield?" "Yes, it is the most out of the world and peaceful and tranquil and in every way satisfactory home I have had experience of in my life." "The marriage pleases you, Mr. Clemens?" "Yes, fully as much as any marriage could please me or perhaps any other father. There are two or three tragically solemn things in this life, and a happy marriage is one of them, for the terrors of life are all to come. A funeral is a solemn office, but I go to them with a spiritual uplift, thankful that the dead friend has been set free. That which follows is to me tragic and awful - the burial. I am glad of this marriage, and Mrs. Clemens would be glad, for she always had a warm affection for Gabrilowitsch, but all the same it is a tragedy, since it is a happy marriage with its future before it, loaded to the plimsoil line with uncertainties." Among the guests at the wedding were Richard Watson Gilder, Mrs. Gilder and three daughters, Mr. and Mrs. A. M. Wright of Boston, Mrs. E. F. Bauer and the Misses Flora and Marion Bauer of New York, Miss Lillian Burbank, Miss Marie Nichols, Mrs. John B. Stanchfield, Mr. and Mrs. Frank J. Sprague, Miss Foot, Miss Comstock, Miss Mary Lawton, Mr. and Mrs. Theodore Gaillard, Mr. and Mrs. Charles Hapgood, Mr. and Mrs. Albert Bigelow Paine, and Miss Ethel Newcomb, all of New York. Humorist Says He Would Not Think of Dying at His Time of Life. "I hear the newspapers say I am dying. The charge is not true. I would not do such a thing at my time of life. I am behaving as good as I can. Merry Christmas to everybody! She Was Overcome by an Epileptic Seizure an Hour Before Her Body Was Discovered. REDDING, Conn., Dec. 24. - Miss Jean Clemens, youngest daughter of Mark Twain, was found dead in the bathtub at Stormfield, Mr. Clemens's country home near here, early this morning. Her body lay submerged in water when the young woman's maid discovered it, shortly after sunrise. An attack of epilepsy, to which Miss Clemens had been subject for many years, is believed to have rendered her unconscious while she was taking her morning bath, with the result that she drowned in the water of the bath. Mark Twain, her father, while heartbroken at the blow which has taken away the one daughter who had remained single to be his mainstay in his declining years, is bearing up bravely under the shock, and says that, in spite of his sorrow, he cannot help feeling glad that death came to his daughter at home. He had feared for many months that she might be stricken while on horseback, far away on the lonely country roads, and that she might be mangled beneath the horse's hoofs. He had many warnings that his daughter might be stricken down. Less than a month ago she suffered a violent attack of epilepsy, and for several years she had been under the constant care of an attendant. For several months Miss Clemens was in a sanitarium, but in April last had come to Stormfield in order to be her father's housekeeper and to help him in his literary work as his secretary. Had Prepared for a Jolly Christmas. Miss Clemens herself had no thought of death. Several days ago she invited one of her girl friends in New York to come to Stormfield to spend the holidays and elaborate plans had been made for a jolly Christmas. This friend had been instructed to come today on the Pittsfield express, and Mark Twain had arranged with the New York, New Haven & Hartford officials to have the train stop at Redding, which is a flag station, at 5:19 this afternoon. A telegram was sent to her this morning informing her of what had happened and telling her not to come, but she evidently did not get the message, for she arrived according to arrangement, and was driven at once to Stormfield. Miss Clemens and her father were up late last night discussing plans for Christmas Day and talking of the future. This morning about 6:30 o'clock Katie, one of the maids at Stormfield, who usually accompanied Miss Clemens wherever she went, rapped on her door and asked if she were ready to dress. "No, Katie, you can wait an hour, for I am going to lie in bed and read," said Miss Clemens through the door. She often did this in the morning before arising, so the maid went away. An hour later she returned to the bedroom, which is on the second floor of Stormfield. Miss Clemens was not there. Her Father Hears the News. Katie went at once to the bathroom. One glance inside and the maid screamed in terror. She ran to the door of Mr. Clemens's room, who was still in bed, and told him that he had better come at once. Mr. Clemens hastily donned a bathrobe. The servants were grouped around the bathroom door uncertain what to do. In a few minutes the body had been lifted from the tub, and a telephone call brought Dr. Ernest H. Smith, the family physician and County Medical Examiner, to the Clemens home. For a long time the doctor tried by artificial respiration to bring the young woman back to life, but it was useless. She had been dead at least an hour before he arrived, said the doctor later. Soon after Dr. Smith arrived Mr. Clemens telephoned to Alfred [sic] Bigelow Paine, who has been assisting the author in writing his biography and who lives not far from Stormfield. Mr. Paine and his wife were soon at the house and did what they could for Mr. Clemens. The news of Miss Clemens's death spread rapidly through the countryside, and there were many messages of sympathy and offers of help over the telephone. Many of Mark Twain's neighbors also called in person, and soon the reporters arrived. Mr. Clemens met them and told the sad story of his daughter's death. "My daughter, Jean Clemens, passed from this life suddenly this morning at 7:30 o'clock," he said. "All the last half of her life she was an epileptic, but she grew better latterly. For the past two years we considered her practically well, but she was not allowed to be entirely free. Her maid, who has served us twenty-eight years, was always with her when she went to New York on shopping excursions and such things. She had very few convulsions in the past two years and those she had were not violent. "At 7:30 this morning a maid went to her room to see why she did not come down to her breakfast, and found her in her bathtub drowned. It means that she had a convulsion an could not get out. "She had been leading a very active life. "She spent the greater part of her time looking after a farm which I bought for her, and she did much of my secretarial work besides. Her Last Talk With Her Father. "Last night she and I chatted later than usual in the library, and she told me all her plans about the housekeeping, for she was also my housekeeper. I said everything was going so smoothly that I thought I would make another trip to Bermuda in February, and she said put it off till March and she and her maid would go with me. So we made that arrangement. "But she is gone, poor child. "She was all I had left, except Clara, who married Mr. Gabrilowitsch lately, and has just arrived in Europe." In one of the downstairs room of Stormfield was today a half-trimmed Christmas tree, which the bereaved author pointed to while tears came to his eyes. "My daughter was trimming the tree yesterday and I was helping her," he said. "She was so anxious that the lads and lassies of the neighborhood should have a tree, so we brought this one in and began to trim it for them. Tomorrow there were to have trooped in to see the tree and to get presents from it. "It is all so very sad. Upstairs in my daughter's room are still a number of gifts which she had bought for some of her dear friends, and which were to have been sent out by her today. It will be a sad Christmas for poor old me." Last Monday Miss Clemens went to New York with her maid to meet her father on his arrival from Bermuda. She took advantage of her presence in town to buy several Christmas presents for her friends. Some of these she sent by mail, and they will be received this morning about the same time that some of her friends learn of her death. Dr. Smith, after leaving Stormfield, made out a certificate of death from accidental cause, which he sent on to Clifford B. Wilson, the Coroner at Bridgeport. In this the doctor stated that the primary cause of death was epilepsy and the secondary cause drowning. "It was a plain case and no mystery about it," said Dr. Smith. "There have been two other cases of epilepsy here recently which met death in the same way. It is very common for an epileptic to fall unconscious in the water while bathing. One of the other cases here recently was drowned in three or four inches of water after being rendered unconscious by an attack of epilepsy. "The bath tub in which Miss Clemens met her death was nearly full of water when I got there. She simply must have lost consciousness and sunk down beneath the surface. Mr. Clemens is bearing up bravely under the blow, and he will survive it, I am sure. He is strong and healthy for a man of his years." Miss Clemens had recently attended to much of her fathers mail. Only yesterday she telephoned to the Associated Press a statement from her father, contradicting the newspaper reports that he was in failing health. A cablegram was sent today to Mr. Clemens's married daughter, who with her husband, is spending her honeymoon abroad. It told her of her sister's death. Arrangements for the funeral have already been made. The body will be taken to Elmira, N.Y., and will on Sunday be buried from the former home of Mr. Clemens's wife. Miss Clemens will be laid at rest alongside her mother in the old churchyard at Elmira. Mr. Clemens will not be able to attend the funeral. He is now 74 years old, and his physicians discourage the unusual fatigue that he would necessarily undergo on such a journey. For the present he will remain at Stormfield. Mark Twain's Plans for His Daughter. It had been Mr. Clemens's ambition for the pasty twenty years to provide a future home for his daughters, and to leave them a sufficient income to continue their existence after his death in the same comfort as they had before. As the copyrights on all his books are rapidly expiring, and soon will bring in no return, it occurred to him that if he wrote an autobiography, which might be brought out, a little in each volume, in a new edition of his works, which the publishers should publish after his death, that he might secure a new copyright for these volumes. Much of this autobiography is finished, and the home for his daughters built, but there seems to be no occasion for either precaution at present. Miss Clara Clemens, who is a musician, was married last Summer to Ossip Gabrilowitsch, the celebrated Russian pianist, and the two are now in Europe. Miss Clemens had been engaged to Gabrilowitsch twice before, and each time the engagement had been broken. Last Spring the pianist was seized with a desperate illness and spent some time in a hospital near the point of death. At that time Miss Clemens spent a great deal of time with him and they were married soon after his recovery and left for Europe. MARK TWAIN BEARS UP WELL. Body of His Daughter, Accompanied by Household Servants, Taken to Elmira. REDDING, Conn., Dec. 25. - Mark Twain has borne up well under the bereavement which came to him yesterday in the death of his daughter, Miss Jean Clemens. Today he was fully composed and gave final directions for the removal for the body to Elmira, N. Y. The coffin was taken from Stormfield this evening in time to be placed on the 7 o'clock train for New York. Several of the household servants accompanied it with a few of the most intimate friends of Miss Jean Clemens and of Mr. Clemens. A great many messages of sympathy from friends in all parts of the country were received today by Mr. Clemens. Returns to Bermuda Suffering from Indigestion. Samuel M. [sic] Clemens (Mark Twain) sailed for Bermuda yesterday. He spent some weeks there late in the year, returning about fifteen days ago to spend Christmas with his daughter, Miss Jean Clemens, at Redding, Conn. She died while he was there. It had been the intention of Mr. Clemens to return to Bermuda with his daughter in April. He denied that his health was in an alarming state. He was simply suffering from indigestion, he said. The length of his stay on the island will depend on how much his indigestion improves there. He may be away for two months. Distinguished Author Returns from Bermuda in Weakened State from Heart Trouble. 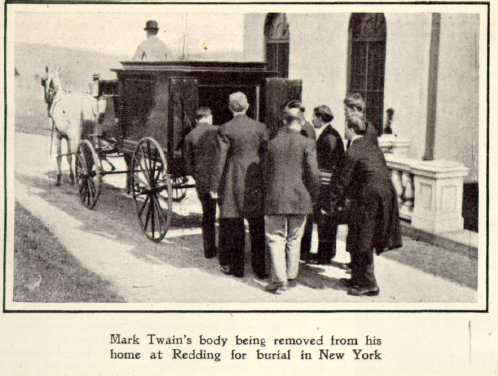 Physicians Meet Him and He is Taken Immediately to His Home at Redding, Conn. Samuel L. Clemens, (Mark Twain,) humorist and author, stricken in health, arrived yesterday from Bermuda on the Oceana. He was so ill when the vessel reached her pier in the morning that he could not be removed until the physicians summoned by wireless got to the pier, at the foot of West Tenth Street. After an examination they consented to his removal. He was carried from the liner and taken across the city in a coach ambulance. He left on the 3:32 P. M. train for his home, at Redding, Conn. Mr. Clemens's condition, it is admitted, is serious, but his physicians believe he will improve in the quiet of his country home. He has angina pectoris. The author made the voyage from Bermuda ill in his stateroom. He spent the Winter in Bermuda, going there immediately after the sudden death of his daughter. He was accompanied only by Albert Bigelow Paine, the author, who has been acting as his secretary. When the Oceana reached her pier Edward E. Loomis, Mr. Clemens's nephew, and the latter's wife and Robert Collier were on hand to meet him. They went at once to his cabin. A few minutes later Dr. Edward S. Quintard of 145 West Fifty-eighth Street, a long-time friend of the author, and Dr. Robert H. Halsey of 118 West Fifty-eighth Street arrived and went to Mr. Clemens's room. The voyage north had not improved the condition of his health. About a week ago he had a severe attack, and from this he did not readily recover. The recent high temperature in Bermuda, according to Mr. Paine, had proved too much for him and went far toward bringing on the attack. Mr. Paine went to Bermuda about two weeks ago, when the news came that Mr. Clemens was failing in health. After the attack of a week ago the physicians concluded that the salt air was not good for him and ordered his immediate return to this country. At Mr. Clemens's request it had been planned that he was to return on the Bermudian, which is scheduled to arrive here on Monday. The author and Capt. Frazer, the skipper are old friends. Later it was decided that it would be dangerous to delay his homecoming. Embarking on the Oceana was quite a task for the sick man. The vessel because of her great draught cannot go alongside a pier. She anchors in deep water, and her passengers are taken out to her in a tender. Mr. Clemens made the trip in a special tug, and was so weak that he had to be carried on board the Oceana. On Wednesday when the vessel was passing through the Gulf Stream, with a fairly rough sea running, Mr. Clemens had a sinking spell. For a time, it is said, there was fear that in his weakened condition he would not rally. Mr. Clemens occupied a starboard stateroom amidships. When the steamer got in his relatives and the physicians found him dressed and lying in his berth, propped up with pillows. The Oceana reached her pier about 10:15 A. M., but it was not until afternoon that he was removed. It is said that the excitement of arriving proved a severe strain, and his departure to the station was preceded by another sinking spell. "I have made but a superficial examination of Mr. Clemens," said Dr. Quintard. "When he gets home we will make a thorough examination of his heart. He has angina pectoris, which is a dangerous state for him. He looks much better than I expected he would." 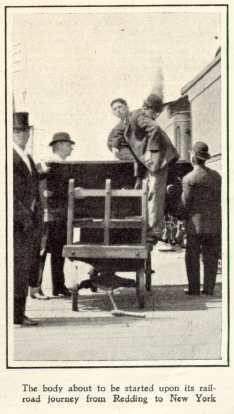 Mr. Clemens was carried from the Oceana in an invalid chair by two stewards. He was assisted into the coach and with Dr. Halsey started for the Grand Central. Mr. Clemens appeared to be extremely weak. He had to rest a few minutes in the invalid chair on the pier before he could make the effort of getting into the vehicle. On reaching the railway station a few minutes after 3 o'clock Mr. Clemens raised his arms feebly while two station attendants lifted him from the carriage to a wheel chair. They took him directly to a drawing room car. MARK TWAIN HOLDS HIS OWN. Passes a Comfortable Day - Country Air Has Good Effect. REDDING, Conn., April 15. - Samuel L. Clemens, (Mark Twain,) who arrived at his country home here last evening, fatigued from his long journey from Bermuda, and very ill, passed a comfortable day with no appreciable change in his condition and was holding his own pretty well. A second nurse arrived today. Dr. R. H. Halsey of New York, who accompanied Mr. Clemens here yesterday, remained with him overnight and returned to New York this morning. The bracing air of the country, it is stated, has had a beneficial effect upon Mr. Clemens's respiratory organs since his arrival here, and much of the distress that accompanied his breathing during the ocean voyage from Bermuda to New York and after his arrival in New York has disappeared. Mrs. Gabrilowitsch and Her Husband, the Pianist, Called by Author's Illness. Mrs. Ossip Gabrilowitsch, who was Miss Clara Clemens, the only surviving daughter of Samuel L. Clemens, (Mark Twain,) and her husband, the Russian pianist, arrived last night on the American liner New York. Mr. Gabrilowitsch has not been playing for a year. He and his wife were in Rome when word reached them of the serious condition of Mr. Clemens. That was ten days ago, and since then they have been traveling to reach Mr. Clemens's home at Redding, Conn.
Before sailing they had been assured by Mr. Clemens's physician that his condition had improved. They were greatly relieved to learn upon their arrival that he had also improved since his return from Bermuda. "We had intended coming to America to spend the Summer with Mr. Clemens," said Mr. Gabrilowitsch. "The news that he had been taken ill in Bermuda simply caused a change in plan and we are here sooner than we had expected." Ossip Gabrilowitsch had Miss Clara Clemens were married at the Clemens home on Oct. 6, 1909. Arrival of Daughter from Abroad Brightens Sick Man Considerably. REDDING, Conn., April 17. - According to those in attendance, Samuel L. Clemens, (Mark Twain,) who is ill at his home, Stormfield, seemed a little improved today. Mrs. Ossip Gabrilowitsch, Mr. Clemens's daughter who reached New York Saturday fro abroad, arrived here today, and her presence seemed to brighten her father very materially. Dr. Robert M. Halsey of New York will remain with his patient until Monday. REDDING, Conn., April 18. - Samuel L. Clemens, (Mark Twain,) who is seriously ill with heart disease at his home near here had a restful night and was brighter and to all appearances better today. Dr. Robert H. Halsey who has been with Mr. Clemens since Saturday, went to New York this morning, seemingly satisfied with the progress Mr. Clemens was making. Mark Twain a Little Weaker. REDDING, Conn., April 19. - Samuel L. Clemens, (Mark Twain,) who is here trying to regain his health after the severe attack of heart trouble that prostrated him on the voyage from Bermuda to New York last week, is a little weaker. Dr. Robert Halsey of New York issued a statement tonight as follows: "Mr. Clemens is very comfortable tonight and passed a quiet day, though he seems to have grown a little weaker." Dr. Halsey will remain with Mr. Clemens. Author's Condition is Critical, but He Is Expected to Live Through the Night. DANBURY, Conn., April 20. - At 11 o'clock tonight Samuel L. Clemens, though he had been sinking all day, and at one time late in the afternoon was thought to be in a very serious condition, was resting at his residence, Stormfield, in Redding, Conn., comfortably enough to assure those in attendance on him that his chances for living through the night were very favorable. His daughter, Clara, and her husband, Ossip Gabrilowitsch, the pianist, and Alfred Bigelow Paine, the humorist's manager and biographer, who comprise the household, felt confidence enough to retire for the night shortly before 11 o'clock. Dr. Robert H. Halsey, the heart specialist who has been in attendance, admitted that his patient was in a critical condition giving his trouble as angina pectoris. Dr. Quintard was called from New York in consultation during the afternoon, but left this evening. Oxygen was resorted to early in the afternoon to stimulate vitality. Although he was weak on his arrival from Bermuda last Tuesday, and had not since recovered his strength, it was not until today that his symptoms became alarming. He was noticeably weak this morning and did not respond to treatment as he had previously. As the day went on he became weaker and collapsed this afternoon. He has been almost in an unconscious condition during the afternoon and this evening. He did not show any interest in his surroundings and took no notice of the people around him. Early in the evening he aroused a little and talked for a short time with his daughter. He does not seem to be suffering any pain. The daughters who have been watching Mark Twain agree that it is simply a case of how long his wonderful constitution can battle with the malady which is gradually overcoming him. He may die during the night or he may live for several weeks, there is no knowing. End Comes Peacefully at His New England Home After a Long Illness. DANBURY, Conn., April 21. - Samuel Langhorne Clemens, "Mark Twain," died at 22 minutes after 6 tonight. Beside him on the bed lay a beloved book - it was Carlyle's "French Revolution" - and near the book his glasses, pushed away with a weary sigh a few hours before. Too weak to speak clearly, "Give me my glasses," he had written on a piece of paper. He had received them, put them down, and sunk into unconsciousness from which he glided almost imperceptibly into death. He was in his seventy-fifth year. For some time his daughter Clara and her husband, Ossip Gabrilowitsch, and the humorists' biographer, Albert Bigelow Paine, had been by the bed waiting for the end which Drs. Quintard and Halsey had seen to be a matter of minutes. The patient felt absolutely no pain at the end and the moment of his death was scarcely noticeable. Death came, however, while his favorite niece, Mrs. E. E. Loomis, and her husband, who is Vice President of the Delaware, Lackawanna & Western Railway, and a nephew, Jervis Langdon, were on the way to the railroad station. They had left the house much encouraged by the fact that the sick man had recognized them, and took a train for New York ignorant of what happened later. Although the end had been foreseen by the doctors and would not have been a shock at any time, the apparently strong rally of this morning had given basis for the hope that it would be postponed for several days. Mr. Clemens awoke at about 4 o'clock this morning after a few hours of the first natural sleep he had had for several days, and the nurses could see by the brightness of his eyes that his vitality had been considerably restored. He was able to raise his arms above his head and clasp them behind his neck with the first evidence of physical comfort he had given for a long time. His strength seemed to increase enough to allow him to enjoy the sunrise, the first signs of which he could see out of the windows in the three sides of the room where he lay. The increasing sunlight seemed to bring ease to him, and by the time the family were about he was strong enough to sit up in bed and overjoyed them by recognizing all of them and speaking a few words to each. This was the first time that his mental powers had been fully his for nearly two days, with the exception of a few minutes early last evening, when he addressed a few sentences to his daughter. For two hours he lay in bed enjoying the feeling of this return of strength. Then he made a movement and asked in a faint voice for the copy of Carlyle's "French Revolution," which he has always had near him for the last year, and which he has read and re-read and brooded over. The book was handed to him, and he lifted it up as if to read. Then a smile faintly illuminated his face when he realized that he was trying to read without his glasses. He tried to say, "Give me my glasses," but his voice failed, and the nurses bending over him could not understand. He motioned for a sheet of paper and a pencil, and wrote what he could not say. With his glasses on he read a little and then slowly put the book down with a sigh. Soon he appeared to become drowsy and settled on his pillow. Gradually he sank and settled into a lethargy. Dr. Halsey appreciated that he could have been roused, but considered it better for him to rest. At 3 o'clock he went into complete unconsciousness. Later Dr. Quintard, who had arrived from New York, held a consultation with Dr. Halsey, and it was decided that death was near. The family was called and gathered about the bedside watching in a silence which was long unbroken. It was the end. At twenty-two minutes past 6, with the sunlight just turning red as it stole into the window, in perfect silence he breathed his last. The people of Redding, Bethel, and Danbury listened when they were told that the doctors said Mark Twain was dying of angina pectoris. But they say among themselves that he died of a broken heart. And this is the verdict not of popular sentiment alone. Albert Bigelow Paine, his biographer to be and literary executor, who has been constantly with him, said that for the past year at least Mr. Clemens had been weary of life. When Richard Watson Gilder died, he said: "How fortunate he is. No good fortune of that kind ever comes to me." The man who has stood to the public for the greatest humorist this country has produced has in private life suffered overwhelming sorrows. The loss of an only son in infancy, a daughter in her teens and one in middle life, and finally of a wife who was a constant and sympathetic companion, has preyed upon his mind. The recent loss of his daughter Jean, who was closest to him in later years when her sister was abroad studying, was the final blow. On the heels of this came the first symptoms of the disease which was surely to be fatal, and one of whose accompaniments is mental depression. Mr. Paine says that all heart went out of him and his work when his daughter Jean died. He has practically written nothing since he summoned his energies to write a last chapter memorial of her for his autobiography. He told his biographer that the past Winter in Bermuda was gay but not happy. Bermuda is always gad in Winter and Mark Twain was a central figure in the gayety. He was staying at the home of William H. Allen, the American Consul. Even in Bermuda, however, Mr. Clemens found himself unable to write and finally relied on Mr. Allen's fifteen year-old daughter Helen to write the few letters he cared to send. His health failed rapidly, and finally Mr. Allen wrote to Albert Bigelow Paine that his friend was in a most serious condition. Mr. Paine immediately cabled to Mrs. Gabrilowitsch, his surviving daughter, who was in Europe, and started himself on April 2 for Bermuda, embarking with the humorist for he return to New York immediately after his arrival. On the trip over Mark Twain became very much worse and finally realized his condition. "It's a losing game," he said to his companion. "I'll never get home alive." Mr. Clemens did manage to summon his strength, however, and in spite of being so weak that he had to be carried down the gangplank he survived the journey to his beautiful place at Redding. The first symptom of angina pectoris came last June when he went to Baltimore to address a young ladies' school. In his room at the hotel he was suddenly taken with a terrible gripping at the heart. It soon passed away, however, and he was able to make an address with no inconvenience. The pains, however, soon returned with more frequency and steadily grew worse until they became a constant torture. One of the last acts of Mark Twain was to write out a check for $6,000 for the library in which the literary coterie settled near Redding have been interested for a year, fairs, musicales, and sociables having been held in order to raise the necessary amount. The library is to be a memorial to Jean Clemens, and will be built on a site about half a mile from Stormfield at Selleck Cross Roads. It is certain to be recalled that Mark Twain was for more than fifty years an inveterate smoker, and the first conjecture of the layman would be that he had weakened his heart by overindulgence in tobacco. Dr. Halsey said tonight that he was unable to say that the angina pectoris from which mark Twain died was in any way a sequel of nicotine poisoning. Some constitutions, he said, seem immune for the effects of tobacco, and his was one of them. Yet it is true that since his illness began the doctors had cut down Mark Twain's daily allowance of twenty cigars and countless pipes to four cigars a day. No deprivation was a greater sorrow to him. He tried to smoke on the steamer while returning from Bermuda, and only gave it up because he was too feeble to draw on his pipe. Even on his death bed when had passed the point of speech, and it was no longer certain that his ideas were lucid, he would make the motion of waiving a cigar, and smiling, expel empty air from under the mustache still stained with smoke. Where Mark Twain chose to spend his declining years was the first outpost of Methodism in New England, and it was among the hills of Redding that Gen. Israel Putnam of Revolutionary fame mustered his sparse ranks. Putnam Park now incloses the memory of his camp. Mark Twain first heard of it at the dinner given him on his seventieth birthday, when a fellow-guest who lived there mentioned its beauties and added that there was a vacant house adjoining his own. "I think you may buy that old house for me," said Mark Twain. Sherwood Place was the name of that old house, and where it stood Mark Twain reared the white walls of the Italian villa he first named Innocence at Home, but a first experience of what a New England Winter storm can be in its whitest fury quickly caused him to christen it anew Stormfield. The house had been thus described by Albert Bigelow Paine: "Set on a fair hillside with such a green slope below, such a view outspread across the valley as made one catch his breath a little when he first turned to look at it. A trout stream flows through one of the meadows. There are apple trees and gray stone walls. The entrance to it is a winding, leafy lane." Through this lane the "Innocent at Home" loved to wander in his white flannels for homely gossip with the neighbors. They remember him best as one who above all things loved a good listener, for Mark was a mighty talker, stored with fairy tales for the maids he adored, and racier, ruder speech for more stalwart masculine ears. It is a legend that he was vastly proud of his famous mop of white hair, and used to spend the pains of a Court lady in getting it to just the proper stage of artistic disarray. The burial will be in the family plot at Elmira, N. Y., where lie already his wife, his two daughters, Susan and Jean, and his infant son, Langhorne. No date has yet been set, as the family is still undecided whether or not there shall be a public funeral first in New York City. It is probable that Stormfield will be kept as a Summer place by Mrs. Gabrilowitsch, who is very fond both of the house and the country, although her husband's musical engagements make it necessary that she spend a part of each year abroad. Mr. Paine said tonight that Mark Twain had put his affairs in perfect order and that he died well off, though by no means a rich man. He leaves a considerable number of manuscripts, in all stages of incompleteness and of all characters, many of them begun years ago and put aside as unsatisfactory. Mrs. Gabrilowitsch will aid Mr. Paine in the final decision as to what use shall be made of these. Mark Twain and Halley's Comet. To the Editor of The New York Times: I wish to draw your attention to a peculiar coincidence. Mark Twain, born Nov. 30, 1835. Last perihelion of Halley's comet, Nov. 10, 1835. Mark Twain died, April 21, 1910. Perihelion of Halley's comet, April 20, 1910. It so appears that the lifetime of the great humorist was nearly identical (the difference being exactly fifteen days) with the last long "year" of the great comet. Friends Will Attend Simple Services in Brick Presbyterian Church - Burial in Elmira. REDDING, Conn., April 22. - New York friends of Samuel L. Clemens (Mark Twain) will have opportunity to pay their respects to his memory tomorrow afternoon. His body is to arrive at the Grand Central Station on the Pittsfield Express at noon, and at 4 o'clock simple funeral services will be held in the Brick Presbyterian church at Fifth Avenue and Thirty-seventy Street. At these relatives and as many of Mr. Clemens's friends as possible will be present. Afterward the body will be taken to Elmira, N. Y., where, after another simple service, it will be buried beside those of his wife and children. Jarvis Langdon,nephew of Mr. Clemens, said this afternoon that if Mrs. Gabrilowitsch, the only surviving member of the immediate family, had consulted only her own wishes, there would have been no public funeral, but only a simple service at Elmira. When arrangements were discussed, however, she said she felt that her father belonged to the public to a large extent, and that the public had certain rights in regard to him at a time like the present. She therefore consented to a semi-public service in New York. Albert Bigelow Paine, one of Mr. Clemens's leterary exectors, left on the early morning train for new York to consult E. E. Loomis, one of the trustees of the will, and the firm of Harper & Brothers, who have the public services in charge. When he returned at 5 o'clock he announced that final arrangements had been made. He said the coffin had been chosen, a severely plain one of mahogany. F. E. Duneka of the publishing firm completed the arrangements for the funeral. The body will be taken to the West Redding Station at 10 o'clock tomorrow mornig and placed on board the Pittsfield express. It will be accompanied by Mr. and Mrs. Gabrilowitsch, Mr. Paine, and servants who have been in Mr. Clemens's service for many years. All business will be suspended in this vicinity, and the villagers and farmers from the surroundng hills will assemble. On the arrival of the body in New York it will be taken to the Brick Presbyterian Church. The church service will consist of little more than a brief address by Dr. Henry Van Dyke of Princeton, and there will be no pallbearers. There will probably be no music. At the conclusion of the services the body will be taken to Elmira, N. Y., in Lake Forest, the private car of E. E. Loomis, Vice President of the Delaware, Lackawanna & Western Railroad. Services will be held at the home of Gen. Langdon, and the Rev. Joseph H. Twichell of Hartford, a life-long friend of Mr. Clemens, will make an address. Late today the body was prepared for burial and dressed in the white cashmere which Mr. Clemens so constantly wore in the later years of his life. It lies in his many-windowed room on the second floor. Some of the persons of the neighborhood were permitted to see the body today. According to Albert Bigelow Paine, the will is to be read in about a week. He believes that Mrs. Gabrilowitsch will be the sole heir, and will be asked by a codicil to make provision for some of the older servants. Katie Leary has been housekeeper for twenty-nine years. The trustees are E. E. Loomis, Jarvis Langdon, and Z. S. Freeman of the Liberty National Bank. The house was not barred and shuttered today, but looked cheerful in the Spring sunshine, as Mr. Clemens would have wished it. The doors and windows downstairs were wide open and the sunlight was allowed to flood in. All the windows of his room were open, and breezes played through their curtains. The whole atmosphere was strikingly typical of the genial man who had made a dwelling there. After the suspense and anxiety of hte week the worn-out watchers spent the day in rest. Mr. and Mrs. Gabrilowitsch remained in their apartments all day. The nephew, Jarvis Langdon, was about the house doing what was necessary. During the day so many telegrams of sympathy poured in that the telegraph operator in the little station at Redding used up all his forms. Some of the more prominent names represented were: President Taft, ex-President Roosevelt, William Dean Howells, H. M. Alden, Melville E. Stone, William Milligan Sloan, Robert Underwood Johnson, Archdeacon J. Townsend Russell, W. R. Coe, Brander Matthews, Frank A. Munsey, Henry Watterson, George Barr McCutcheon, George W. Cable, Walter Scott, Lynn Roby Meeking, and Capt. Horace E. Bixby, the Mississippi pilot who fifty years ago "taught" Mark Twain the river. A message was received form the authorities of Hannibal, Mo., Mark Twain's boyhood home, asking that his body be taken there for burial. Mrs. Gabrilowitsch in reply said that as the family burial ground was in Elmira, N. Y., it was thought best that the body be taken there. A Prayer Not Yet Published. Dan Beard, the artist and naturalist, who lives only a half mile from Stormfield, was a caller. He went to leave his own and his wife's cards. Afterward he grew reminiscent, and sitting on a large rock, where he said Mark Twain had often sat, he told a few stories of the dead author. He said Mark Twain has shown him one day a draft of a prayer. Mr. Beard was much impressed and asked the author why he did not publish it. "Ah," said Mark Twain, "that must not be published until after my death. While a man is alive he cannot speak the truth, but when he is dead it is different." Then he went on to tell in his peculiar drawl: "I showed this to my secretary, and she said: 'Do not publish it; it is blasphemy.' I showed it to my daughter. 'Father,' she said, 'do not publish it; it is blasphemy.' Then in despair, I showed it to my butler. He said: 'Mr. Clemens, do not publish it; it is blasphemy.' So I added four lines and then they were all satisfied." Mr. Beard told a recent experience the humorist had confided to him. He was walking up Fifth Avenue when a little girl about 10 years old slipped her hand in his and started to match his stride. "I'm awful glad to see you," she said. "Are you? said he. "That's very nice." "Yes," she answered. "I knew you right away." They continued to the next corner chatting, he proud that he could be so well known that a little girl like this could pick him out. Suddenly a horrible thought struck him and he stopped. "Who am I?" he asked, turning around. "Why," answered his companion, "Buffalo Bill, of course." An effort was made to get the text of the prayer mentioned by Dan Beard, but Mr. Paine said he did not know of the manuscript. Mr. Paine is one of Mark Twain's literary executors, there being another. They Opened the Coffin in the Brick Church and 3,000 Persons Saw His Dead Face. Dr. Van Dyke Pays His Tribute and the Rev. Joseph Twichell Chokes Down His Tears to Pray. A short pause was made in the journey of Samuel Langhorne Clemens to his final resting place in Elmira yesterday, and he was brought to the Brick Church, at Fifth Avenue and Thirty-Seventy Street, that those who knew him might not be deprived of opportunity to see his face for the last time. A reading from the Scripture, a short address, and a prayer constituted the simple service. Then, for an hour and a half, a stream of people from all walks of life passed in front of the bier. The same spirit which had led to the unbarring of Stormfield to breezes and sunshine on the day after the death pervaded the church yesterday. There was no gloom; only the peace that Mark Twain would have desired. The people who passed by the coffin saw not so much the man Samuel L. Clemens, a philosopher through the necessity for bearing misfortune, as Mark Twain, who was everything from Huckleberry Finn and Colonel Mulberry Sellers. Mr. and Mrs. Ossip Gabrilowitsch, the latter heavily veiled, sat in the front pew on the left side of the church. With them were Mr. and Mrs. E. E. Loomis and William Dean Howells. Behind these sat the Albert Bigelow Paines and Jarvis Langdon. In another pew were the widow and children of Samuel Moffett, a favorite nephew of Mr. Clemens, who died in California several years ago. The funeral party from Redding arrived in New York at noon, Mr. and Mrs. Gabrilowitsch going first to friends. The male members of the party accompanied the body to the Brick Church. At the Grand Central Station a few who knew the train on which the party was to arrive had gathered, and when the body was taken out a crowd collected and all heads were bared as the coffin was lifted into the hearse. It was originally intended to open the church to the public at 3 o'clock, after the holders of the 400 tickets which had been distributed had taken their seats. But the crowd at Thirty-seventh Street and Fifth Avenue threatened to block traffic on the avenue, and at 2:30 it was decided to let them in. the church was almost immediately filled. In fact, several hundred persons who could not be accommodated remained on the streets during the service until it was time to view the body. Inside the church complete quiet was maintained, even while the people were taking their seats. The effect was enhanced by the soft tones of the organ when Clarence Dickinson began playing Chopin's Funeral March. As he changed to the Death's Chariot music of Grieg's "Death of Asa" the Rev. Dr. Henry Van Dyke and Dr. Joseph H. Twichell, both old friends of the author, came through the curtains into the pulpit. Dr. Van Dyke stepped forward and began to read the Scriptural part of the Presbyterian funeral service. When he had finished he entered without a break on his address. It was a simple and dignified estimate of the worth of the work that Mark Twain's life had produced. Throughout it was evident that the speaker was making a strong effort to keep down his emotion and control his voice. There was a noticeable break in his voice when he said: "Now he is gone." In part Dr. Van Dyke said: "Those who know the story of Mark Twain's career know how bravely he faced hardships and misfortune, how loyally he toiled for years to meet a debt of conscience, following the injunction of the New Testament to provide not only things honest, but things 'honorable in the sight of all men.' "Those who know the story of his friendships and his family life know that he was one who 'loved much' and faithfully, even unto the end. Those who know his work as a whole know that under the lambent and irrepressible humor which was his gift there was a foundation of serious thoughts and noble affections and desires. "Nothing could be more false than to suppose that the presence of humor means the absence of depth and earnestness. There are elements of the unreal, the absurd, the ridiculous in this strange, incongruous world which must seem humorous even tot he highest Mind. Of these the Bible says, 'He that sitteth in the heavens shall laugh; the Almighty shall hold them in derision.' But the mark of this higher humor is that it does not laugh at the weak, the helpless, the true, the innocent; only at the false, the pretentious, the vain, the hypocritical. "Mark Twain himself would be the first to smile at the claim that his humor was infallible. But we may say without doubt that he used his gift, not for evil, but for good. The atmosphere of his work is clean and wholesome. He made fun without hatred. He laughed many of the world's false claimants out of court, and entangled many of the world's false witnesses in the net of ridicule. In his best books and stories, colored with his own experience, he touched the absurdities of life with penetrating but not unkindly mockery, and made us feel somehow the infinite pathos of life's realities. No one can say that he ever failed to reverence the purity, the frank, joyful, genuine nature of the little children, of whom Christ said, 'Of such is the Kingdom of Heaven.' "Now he is gone, and our thoughts of him are tender, grateful, proud. We are glad of his friendship; glad that he has expressed so richly one of the great elements in the temperament of America; glad that he has left such an honorable record as a man of letters, and glad, also for his sake, that after many and deep sorrows, he is at peace, and we trust happy in the fuller light. "Rest after toil, port after stormy seas, Death after life doth greatly please." Bad News to Dr. Twichell. Then the Rev. Dr. Joseph H. Twichell of Hartford came forward to deliver the prayer. Associated with the dead author from the middle and happiest part of his life, the minister who performed the marriage that brought so much happiness into Mr. Clemens's life and lived to hold the funeral services of not only the wife, but of three of the children born of the marriage, it was no wonder that when he came to deliver a prayer at the death of his friend his voice should fail him. Throughout the short service he had sat with bowed head to conceal the fact that tears had found their way to the surface. Now he made a determined effort to control himself, and finally was able to say what he had to say. Although fully as old as Mark Twain, Mr. Twichell carries his age well. He is a big, vigorous-looking man. With his mass of heavy white hair he does not look unlike Mark Twain himself. His prayer, except for the benediction by Dr. Van Dyke, ended the service. When he left the pulpit and retired into the robing room, he received a blow that was particularly sad owing to the circumstances under which it came - a telegram saying that his wife was seriously ill in Hartford and that he must return there at once. He left the church immediately and took the first train for his home. It was arranged that in his stead the Rev. Samuel E. Eastman, pastor of the Park Church, should officiate at the services in Elmira. 3,000 Passed the Coffin. The service in the Brick Church lasted only twenty minutes. It is estimated fifteen hundred persons crowded to hear it. At its conclusion it was announced that the coffin would be opened. The lines of those within the church began to pass around it, and the crowd from the street pushed in. This was at half past three. there was no abatement in the stream for the next hour and a half. Finally at 5 o'clock it was found necessary to close the doors, as the body had to be taken to Hoboken and put aboard the special train for Elmira. More than three thousands persons meantime had passed in front of the coffin. Every walk of life was represented in the line, which filed slowly past the coffin. Before the doors were opened a score of brightly dressed little girls appeared in front of the church, each with flowers in her hand. They were disappointed at not being allowed to enter, but the ushers appeased them by taking their flowers and setting them near the bier. When the people had been filing past only a few minutes it could be seen that almost every nationality was represented. There were several negroes. Jervis Langdon, who was standing near the head of the coffin, was much interested in one of the persons who passed him. He said that the man looked the very picture of tramphood, but his bearing was easy, and he seemed to be unconscious of his tattered clothes, stopping for along look at he face of Mark Twain. Mr. Paine also saw him, and said he was probably some one who had seen better days, in which he had read Mark Twain and conceived a liking for his work. All religions were represented. Some of those who passed crossed themselves as they did so. Bay Wreath on the Coffin. LAST SCENE AT THE OLD HOME. Mark Twain, When Ill, Wouldn't Be Carried in There - Stood for a Greeting. REDDING, Conn., April 23. - Less than two weeks ago Mark Twain arrived at Stormfield, having been brought back from Bermuda by Albert Bigelow Paine when he was told that his friend was dangerously ill. Mr. Clemens had to be carried from the steamer to his carriage, and in all the intermediate steps of the journey. But when he arrived at his hilltop home and the carriage drew up at the doorway, he insisted on getting out himself. This was because Katie Leary, his housekeeper for twenty-nine years, and his butler Claude, stood at the door to welcome him. It did not suit Mark Twain's notion of courtesy, Mr. Paine said, to be carried in and not be able to greet them properly. He weakly alighted and then drew himself up to his full height. Off came his big hat with a full sweep, and then he made one of his old-fashioned low bows and spoke to them. Not until then would he allow himself to be helped. It was the last time he walked unaided. Today before his body was carried to New York, he lay in the beautifully furnished living room on the lower floor, among his books. He had been dressed in one of his white cashmere suits and brought down there the night before. The unshuttered windows let in a stream of sunlight, and the breeze fluttered the light curtains. It was a perfect day. At 9 o'clock it was announced that Mrs. Gabrilowitsch, his only surviving daughter, Clara, was coming downstairs. The other members of the household withdrew and she went into the living room alone. The doors were locked. In about half an hour she came out, drawing her veil about her face. The coffin was placed in the village hearse, drawn by a team of white horses, and the little procession started for the four-mile drive to the Redding station. Mr. and Mrs. Paine and Jervis Langdon were in one carriage with the butler, Claude, and Mr. and Mrs. Gabrilowitsch followed in a carriage which had been presented to Mr. and Mrs. Clemens at the time of their marriage. On the front seat sat Katie Leary. As they went over the hills to the railroad station many of the townsfolks were seen in front of their houses. The men uncovered as the hearse passed. On the way Dan Beard, his wife, and children joined the procession. Another group of country folk was gathered at the railroad station. Most of them were members of the Redding Library Club, in which Mark Twain was deeply interested, and to which, besides giving it all his superfluous books, he had drawn a check for $6,000 the day before his death. They stood in silence during the short wait for the train, and the men again uncovered as the coffin was lifted on the train. Mr. and Mrs. Gabrilowitsch retired into the stateroom compartment of the parlor car. The remainder of the party was made up of Jervis Langdon, Albert Bigelow Paine, Dan Beard, and Harry Lounsbury, the Stormfield Superintendent. The conductor of the train, which was the Pittsfield Express was M. H. Lyons. He had become well acquainted with Mark Twain owing to the fact that the author always waited for his train in going to and from the city. The dead author used to say that he enjoyed talking with Lyons. Leaves Everything to His Daughter, Mrs. Gabrilowitsch. REDDING, Conn., May 8. - Under the will of Mark Twain, filed for probate at Redding today, all his property, save 5 percent in ready cash, is bequeathed in trust to his only daughter, Clara Clemens Gabrilowitsch. The 5 percent cash is given to her outright. Arrangements are made for quarterly payments of interest to Mrs. Gabrilowitsch by the trustees.Mr. Clemens remarked in his will that he took this method of bequeathing his estate to his daughter in order to leave the property "free from any control or interference from any husband she may have." The home, Stormfield, is valued at $30,000, and there is thought to be about $150,000 on deposit in banks. No estimate has been made of the literary assets, but they will be ascertained by the trustees of the will later in the week. The will was dated Aug. 17, 1909, and covers eight typewritten pages. It was drawn in Redding and witnessed by Mr. Clemens's secretary, Albert Bigelow Paine, Harry Lounsbury, Superintendent of Mr. Clemens's estate, and Charles G. Sark of New York. The will appoints Jarvis Langdon of Elmira, N. Y.; Zohet S. Freeman, and Edward E. Loomis of New York as trustees and executors. When the will was drawn, a second daughter, Jean Clemens, was alive, and by the terms of the will each daughter is to receive 5 per cent of all money on deposit in the bank at once, the residue of the estate to be divided equally and invested by the trustees and the income paid quarterly to the heirs. In case of the death of either heir without leaving issue or will, the whole estate is to go to the next of kin. In case there is issue and no will the estate is to go to that issue. The heirs are given the privilege of disposing of their shares by will as they may see fit. In case both heirs to estate die without issue or will, the estate is to go to the next of kin. The will further says that his daughter Clara and his biographer, Mr. Paine, know his desires as to his literary assets, and directs that the trustees be guided by them in their disposal. No bonds are required of the trustees. Humorist's Daughter Announces She Will Give 2,500 to Redding Institution. REDDING, Conn., July 9. - Mrs. Clara Clemens-Gabrilowitsch, daughter of the late Samuel L. Clemens, (Mark Twain,) has formally notified the directors of the Mark Twain Free Library here that she will present to that institution practically the entire library of her father, now in the Redding residence, Stormfield. The gift includes nearly 2,500 volumes. Mr. Clemens drew a check for $6,000 in favor of the Redding library a few days before his death, and the money will be used to erect a building for the institution. Memorial to His Daughter Jean Formally Opened at Redding, Conn.
REDDING, Conn., Feb. 18. - The Mark Twain Library, built as a memorial to Miss Jean L. Clemens, daughter of the humorist, who was drowned in a bathtub in her father's home, Stormfield, on Dec. 24, 1909, was formally dedicated this afternoon. Addresses were made by the Rev. Joseph H. Twichell of Hartford and the Rev. Frederick Winslow Adams of Schenectady, N. Y. The money for the erection of the building was given by Mr. Clemens a few days before his death, to the trustees of the library, which he founded in 1908. the building is of colonial design, one story in height and contains part of the collection of books that formerly constituted the private library of the humorist, and some rare pictures from Stormfield. Andrew Carnegie Makes the Author's Memorial Self-Supporting. The public library founded by the late Samuel L. Clemens (Mark Twain) in Redding, Conn., where he spent the latter years of his life, has been endowed by Andrew Carnegie with a fund sufficient to support it. The library is to be known as the Mark Twain Memorial Library. When Mr. Clemens moved to Redding he placed several thousand volumes from his own library in a small vacant chapel and opened it to the public. Just before his death he erected a building for the library as a memorial to his daughter Jean. After the author's death Mrs. Gabrilowitsch, another daughter, donated the larger part of his remaining library to the collection. The library up to the present time has been supported by voluntary contributions. Humorist's Daughter Finds Connecticut Place Too Isolated. Stormfield, Mark Twain's old home near Redding, Conn., in which the humorist died, has been advertised for sale. He built it with the idea of getting a country home which should be near enough to New York, and yet not too near, in Summer and Winter; but his daughter, Mrs. Clara Clemens Gabrilowitsch, to whom it passed after his death, found it too far away for the needs of an artist whose affairs required frequent presence in the metropolis. She and her husband, Ossip Gabrilowitsch, lived in it intermittently until 1914, but since then they have spent their Summers at Seal Harbor, Me., and most of the Winter seasons in New York. The house, built on 248 acres acquired by Mr. Clemens, stands on a hilltop in the section where General Israel Putnam raised his troops in the revolution. It embodies a good many of the humorist's own ideas of architecture. The house was built in 1907, but the humorist did not find the happiness he expected there. His daughter Jean, who had lived with him for many years, was drowned in her bath at Stormfield on Christmas Eve, 1909, as a result of an epileptic stroke, and Mark Twain was still suffering from grief over her death when he died on April 21 following. TWAIN HOME A REST CAMP. Stormfield Estate to be a Retreat for Wounded Men. Stormfield, the estate at Redding, Conn., which was the home of Mark Twain, has been given by his daughter, Clara Clemens (Mme. Ossip Gabrilowitsch) for the use of convalescent soldiers and sailors of the artistic professions. Mme. Gabrilowitsch, though admitting that she had turned Stormfield over for the use of wounded men would not discuss the subject further, saying that the affairs of the organization which was to control the estate were not yet complete. Clara Clemens Gabrilowitsch Aids Artists' War Service. Clara Clemens Gabrilowitsch has turned over Stormfield, the home of Mark Twain at Redding, Conn., as a convalescent home in charge of the Artists' War Service League, recently incorporated under the laws of the State of New York. The objects of this organization are similar to those of the American Friends of Musicians in France, except that it proposes to aid men of all the artistic professions in the service and their dependents, instead of confining itself to musicians alone. An honorary committee named for the purpose of stimulating membership now includes Rudyard Kipling, representing literature; Enrico Caruso, music; Daniel C. French, sculpture, and John Drew, representing the drama. J. F. D. Lanier will be Treasurer and Winslow, Lanier & Co. will act as bankers for the fund raised by the league. The trustees of the Samuel L. Clemens estate have sold "Stormfield," near Redding, Conn., to Mrs. Margaret E. Given. The property contains abut 200 acres, with a stucco residence of Italian architecture, containing eighteen rooms and five baths built in 1907 and occupied by Mr. Clemens (Mark Twain, the world famous humorist) until his death in 1910. Hamilton Iselin & Co. were the brokers in the deal. REDDING, Conn., July 25. - Stormfield - the home of Samuel L. Clemens (Mark Twain), in the closing years of his life - was burned early today. The picturesque villa on the ridge of this town was unoccupied for many years after Mr. Clemens's death, but was bought in December by Mrs. Margaret E. Givens of New York, as a Summer home. The home was built to carry out the ideas and wished of Mr. Clemens and with the other buildings comprised a country estate. In this home Mark Twain spent his last years, and as he had expressed it, experienced some of the deepest sorrows of his life, as well as some of his happiest days. Here his younger daughter, Janet [sic], met a tragic death and here there was a burglary which aroused widespread interest. In Stormfield, Mr. Clemens lay ill for a long time and from it his body was borne to its last resting place. After a visit to Stormfield William Dean Howells wrote of Mark Twain in his home: "He showed his absolute content with his home. Truly he loved the place." Mrs. Givens, her daughter Thelma, and her son Eben, were in the house when the latter discovered the fire in the laundry. They were obliged to flee in their night garments. The flames could be seen for a long distance and farmers hastened tot he place to assist the Redding fire department and neighbors. The property was originally offered at $175,000 and the house was valued at a considerable part of that figure. It was insured. The fire is believed to have started from spontaneous combustion among some painting materials which were in the laundry. Neighbors saved a few things including articles which had been thought much of by Mr. Clemens. Among them was a carved mantel brought by him from Scotland. G. L. Hunter Is Reported Acting for a Wealthy New Yorker. REDDING, Conn., April 17. - The Mark Twain place, where stand the ruins of the former home of the author, burned three years ago [sic] has been sold to George Leland Hunter, who, it is understood, represents a wealthy New York man who is expected to erect an elaborate residence on the site. Mr. Hunter recently purchased and occupies the house known as The Lobster Pot, given by Mark Twain to his social secretary, Miss Virginia Lyon. He is author of several books on tapestries. There is only plated ware in this house now and henceforth. You will find it in that brass thing in the dining room over in the corner by the basket of kittens. If you want the basket, put the kittens in the brass thing. Do not make noise - it disturbs the family. You will find rubbers in the front hall by that thing that has the umbrellas in it - chiffonier, I think they call it, or pergola, or something like that. Please close the door when you go away. "yes, that little note was called forth by me. It was written just after a friend of mine and myself broke into Mark Twain's place, "Stormfield." He smiled at Mark Twain's now famous bit of fooling with a reminiscent air. "It was a long time ago," he went on, staring at nothing; "sixteen years." He lapsed into silence. "Do you remember much about it?" "It was 'that brass thing' mentioned by Mark Twain in his little note to the next nocturnal visitor that made all the trouble. " 'That brass thing' was a large brass bowl on the sideboard, and when we tried to get the silver out, my friend noticed it. He was afraid we'd knock it off, so he took it down carefully and laid it on the floor. That was a bad move. "You see," said the ex-burglar in a matter of fact tone, "we didn't want to make any more noise than we could help, anyway. And when we tried to break into the sideboard, it began to seem pretty risky. So we decided to take the sideboard out. We moved it down the road a way, and - "
"Moved it out of the house, and down the road," he replied patiently. "Sure. And when we got it out and away from the house we opened it. That was all right. But we went back after that to see what else we could find. The Faux Pax. We didn't get very far on that second trip. My friend was moving around in a quiet sort of way, when all of a sudden there came a terrific band from the part of the room where he was. It was 'that brass thing' he had taken so carefully off the sideboard; he'd gone and stumbled over it in the dark where it lay on the floor. "Well, after that things began to happen, and they happened fast. Somebody came down from upstairs and turned on a flashlight from the stair landing. " 'Hello,' said this person, but we didn't wait to answer politely. We decided that it was about time to blow, and we did that without losing any time. We decided to get the early morning train away from those parts. That was a bad move too. There weren't very many people on it, and we were a little conspicuous, I guess. You know how all those trains are - everybody knows everybody else, or pretty close to it. But we were strangers. "However, we didn't have much time to feel out of it on account of being strangers. All of a sudden twelve men came into the car, and the way they looked at us made us pretty sure they wanted to have us join them. "My friend ran to the other end of the car, out through the door and jumped off the train. It's a wonder he didn't break his neck; that train must have been going about fifty miles an hour. I didn't have much time to think about what had happened to him, though. Those fellows made a beeline for me. "The first of them had a gun, and it was pointed in my direction. So I took out my own gun - I had it right here like this, in my right-hand coat pocket. It took it out and I let fly with two or three shots toward the ceiling of the car. I thought might be able to scare them. But I was fooled. There were all old hands at that sort of thing. One of them got close enough to hit me over the head with a blackjack. Right here is where he landed." The ex-burglar pushed back the hair from his forehead and showed a white scar just at the hair's edge. "He hit me with it," went on the ex-burglar, frowning, "and then I got mad. I grabbed hold of him and we started to wrestle around in the aisle of the car. I tripped him, but he swung me around as we fell and landed on top of me. He was a big man, bigger than I. He had me by the wrist, but I was crazy by that time, couldn't see what I was doing, on account of the blood in my eyes. I wriggled the gun around into something and pulled. Later I learned I had shot the policeman in the leg. "I say 'later', because that's all I can remember until I found myself lying on the embankment beside the train with handcuffs on. "Then came the trial, and I got ten years. It was interesting to hear what Mark Twain had to say about my visit. He said I scared away most of the servants and didn't get what I was after; and that now I was in jail, and that if I kept on I would go to Congress." Albert Bigelow Paine, in his biography of Mark Twain, says: "Claude, the butler, fired a pistol after them (the burglars) to hasten their departure and Clemens, wakened by the shots, thought the family was opening champagne and went to sleep again." One would expect that the Mark Twain burglar might have some feeling of bitterness in connection with any Mark Twain products, but this is far from being the case. The ex-burglar is, as a matter of fact, a Mark Twain enthusiast. He has read most of the author's writings, and they remain his favorite books. Indeed, the ex-burglar was discovered through his coming to the establishment of Harper & Brothers to get the recently published autobiography of Mark Twain. While he was getting it he modestly divulged the information that he had once paid the famous author an evening visit without invitation. "My visit to Mark Twain was the last such exploit I ever made," he said. "Not because I was a 'disappointed burglar,' as Mark Twain said - for I took away all the silverware - but because I have since come to the conclusion that crime doesn't pay." NEW SMYRNA, Fla., April 9 (AP). Albert Bigelow Paine of West Redding, Conn., author and biographer, died here tonight after an illness of four weeks. His age was 75. A member of the Pulitzer Prize Committee for many years, he had just finished reading a novel which may bring its author the award next month. Mr. Paine spent the Winter in South Florida and was en route to New York when he was stricken and brought to a hospital here. For the past forty years, Mr. Paine had spent most of his time in Europe and the East. Survivors include the widow, Mrs. Dora L. Paine, who was with her husband; three daughters. Mrs. Louise Paine Benjamin of New York, associate editor of The Ladies' Home Journal; Mrs. Frances Paine Wade of Paris, France, and Mrs. J. H. Cushman of West Redding, and a sister, Mrs. Carry Alexander of Orange Park, Fla. The body will be sent to West Redding for funeral services and burial. Wrote Twain Biography Albert Bigelow Paine wrote fiction, humor, verse and edited several magazines, but his outstanding work was a three-volume biography of Mark Twain, with whom he lived and traveled for four years. In addition, he wrote "The Boy's Life of Mark Twain" (1916) and "A Short Life of Mark Twain" (1920). He was Twain's literary executor and arranged for publication of "Mark Twain's Letters" (1917). "Thomas Nast - His Period and His Pictures" (1904) was Mr. Paine's first biography. He also wrote lives of Lillian Gish, Captain Bill MacDonald of the Texas Rangers and George F. Baker, New York banker. Mr. Paine lived for several years in France and wrote "Joan of Arc, Maid of France," and "The Girl in White Armor," works which brought him from the French Government the decoration of Chevalier in the Legion of Honor. His travel books, all widely circulated, included "The Car That Went Abroad," "The Ship Dwellers" and "The Tent Dwellers." His first novel was "The Bread Line" (1900) and he followed it in 1901 with "The Great White Way," a title for Broadway and New York's theatrical district that came into general use. All through the years he turned out skits, sketches and a steady string of books for children, the "Hollow Tree," "Arkansas Bear" and "Deep Woods," the first of which were produced in the Nineties and which are still selling. Mr. Paine was born July 10, 1861, in New Bedford, Mass., the fifth child of Samuel Estabrook Paine, a Vermont farmer and storekeeper, and Mercy Coval Kirby Paine of South Dartmouth, Mass., daughter of a family of seafaring folk. When he was a year old, the family moved to Bentonsport, Iowa, where the father owned a store and a farm. But in a few months the elder Paine marched away to the Civil War. After the war the family moved to Xenia, Ill. There Mr. Paine attended a one-room school, writing "compositions" for the weekly "literary" exercises. At 20 he went to St. Louis, learned photography, tramped with camera for three years through the South and then set himself up as a dealer in photographic supplies in Fort Scott, Kan. He kept this up for ten years, but wrote, too, and his first book, "Rhymes by Two Friends" (1893), was also the first book of William Allen White, for it was a collection of their verse. A pleasant note from Richard Harding Davis, accepting a Paine story for Harper's Weekly, decided him to turn author in earnest, and in 1895 he sold his photographic business and went to New York. REDDING, Conn., Oct. 8 - A defective oil burner was blamed today for a $100,000 blaze that destroyed a two-century-old house once owned by Mark Twain. The estimate of the damage was made by the present owner, the Rev. Anson Phelps Stokes Jr., rector of St. Bartholomew's Protestant Episcopal Church, New York, who acquired the twelve-room landmark in 1952 as a summer home. The blaze yesterday afternoon destroyed many antiques, including family heirlooms, according to the owner, who said the loss was partially covered by insurance. Mark Twain had acquired the house for one of his daughters and had named it the "Lobster Pot" because he said it resembled a lobster trap used in Maine. REDDING, Conn., April 29 - The Mark Twain Library this week received a first edition of Twain's "Petition to the Queen of England." The petition is a letter he wrote to Queen Victoria complaining about an income tax England wanted him to pay. Albert Bigelow Paine, the writer's biographer, described it as "one of the most exquisite of Mark Twain's humors." The piece was first printed in Harper's Monthly magazine in December, 1887. That section of the magazine was repaired and rebound and presented to the library's Samuel Clemens Collection. Mark Twain was Clemens' pen name. The edition was found by Duane Haley of Redding, who turned it over to William Ireland Starr, also of Redding. Mr. Starr passed it on to the library. Mark Twain's "Lobster Pot" Studio & Gallery is honored to present a special limited edition "Centennial Collection" of prints commorating Mark Twain's last years in Redding, CT and his death at Stormfield, his Redding home, April 21, 1910. Artist, Susan Boone Durkee, who lives on the original property which Mark Twain called "The Lobster Pot" is pleased to present this exclusive limited edition of prints using the highest quality of archival inks and paper available. Please view the Mark Twain Gallery of her artwork honoring America's most famous writer and humorist.